Friends, thanks a lot for your fantastic feedback and encouragement on our new efforts at Screener. Last two months have been fabulous for the markets. We mentioned in our post on 1st, Aug, 2012 that the appointment of Mr. Chidambaram as finance minister may bring a major change in the sentiments of the markets; in these two months the sentiments have totally changed with many stocks trading at their all time high now. This is one reason why veterans advice that one shouldn’t try to time the markets, rather just stick to the high quality stocks. The current run up has majorly been limited to the large caps and high quality ideas, but going forward, if the markets remain stable, there might be a lot of improvement in the broader mid cap space where many companies are still trading at low valuations. However over a longer term, one should be careful and not get stuck in poor companies. 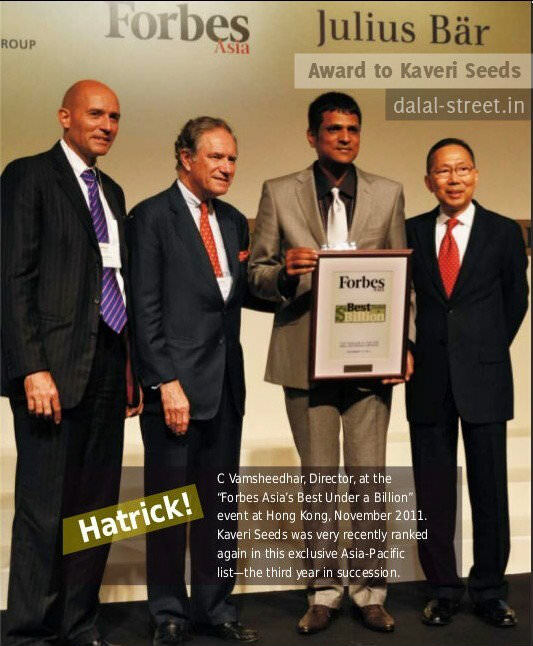 Kaveri Seeds: Kaveri is one of the largest hybrid seeds company. Hybrid seeds is a very promising business area in India, as the better agriculture and improving the current yields is the need of the hour. This area has entry barriers and long term competitive advantages as it takes years of research to build a high quality seed and develop a brand value. The Q1 results were fantastic – Revenues grew 100% from 241 Cr in Jun, 2011 to 480 Cr in Jun, 2012. Similarly the net profit grew 114% from 47 Cr in Jun, 2011 to 101 Cr in Jun, 2012. Similarly the long term growth has been fantastic – the company has grown from a turnover of just 23 Cr in 2003 to 372 Cr in 2012 at a CAGR of 36%! The company gets almost 50-60% of turnover from BT cotton. As per industry estimates, Kaveri is expected to have doubled its market share from about 5% in 2012 to 10% in 2013. The company has two major brands Jaadoo and Jackpot, and a steady growth is expected going forward. The second major area is the Corn Hybrid. The company has a good brand here and has been doing well consistently. Going forward the company seems to be very optimistic on the hybrid seeds for the paddy. As per industry data, hardly 5% of paddy in India is by way of hybrid seeds as of now. This is expected to double out over next few years. Kaveri is also very optimistic on this area in its annual report. Company is almost debt free. Company gets majority of the income in the first quarter. If one notices the balance sheet then we see high inventory at march end but the same is backed up by “advance from customers from sales”. The company has good cash flows. They have parked about 100 Cr in mutual funds last year. The growth has been fantastic till now. One needs to monitor if such growth rates can continue going forward. Company has been paying out a low dividend, despite being cash rich now. This along with Hyderabad tag, limits high allocation to stock. We feel that 900-950 is a good range to buy. Sahyadri Ind: This company is into fibre cement roofing sheets and wind mills. The company has grown faster than the industry and now has an annual turnover of about 375 Cr. The wind energy segment of the company has been doing pretty well and they have been getting best wind mill awards for several years. The roofing sheets sector has started going very well in recent times. Most of the companies have been able to grow well along with expansion in margins. Sahyadri has had poor performance over last 2 years but Q1FY13 has been fantastic – 28% growth in revenues from 125 Cr to 160 Cr and 82% growth in net profits from 9.2 Cr to 16.76 Cr. The company might be back on the track. Stock is trading at a PE of just 4. Stock is trading at 0.6 times its Book Value of 123. Company has been regular in paying out dividends. Generally Q1 is the best quarter and Q2 is weaker. So please don’t annualize the Q1 results. Muthoot Capital: Muthoot Capital is a part of the famous Muthoot group but they are not into gold loan financing. They are a NBFC with focus on lending to two wheelers, three wheelers and light commercial vehicles sector. The company has a small base as of now and is growing very aggressively at a CAGR of 54% over last 5 years. Currently their asset under management (AUM) is about 300 Cr and they plan to quickly more than double the discount levitra purchase asset size to 700 Cr by the end of FY13. Company had come out with a rights issue at Rs 80 last year in the ratio of 1:1. Thanks Ayush for this informative post. With current bullishness in Kaveri stock, do you expect it coming down in buy range or should an investor buy in gradual manner even with current price? Also let us know if there’s any idea about Basant Agrotech, its penny stock but might surprise us moving forward. Of course, no positions, just for educational purpose. I don’t track it closely but would advice caution. One should do through the annual report of last few years and read at auditor comments. If shriram trasport finance is facing difficulty in the commercial vehicles space, how do you expect Muthoot to do well? Is it their locatoon specific advantage that is the key here (state of kerala)? also, how is sihaydri different from a hyderabad industries / everest industries? Perhaps its the advantage of a low base that the company is doing well despite slowdown. As per feedback, Muthoot has an excellent branch network and brand recall in South and hence they do well. Slowly they are expanding to new states too. Sahyadri looks cheaper on valuations front when compared to others in the industry. I don’t think Kaveri is extremely expensive at CMP as the co is on a fast growth track. If one looks 2-3 years ahead, the co targets to be a 1000 Cr turnover co.
What is your opinion on Shriram Transport. Not Vis a Vis Muthoot but on its own merit. Looking at the kind of competitive advantage they have in used vehicle lending, past record, quality of management and now critical scale of economics etc… I am holding this stock for very long term. Yes, Shriram Transport is an excellent co for long term. Can you throw some light on AVT Naturals. According to Screener, the company has being displaying some amazing numbers in terms of ROE, and Profit growth . Yes, AVT has done really well and seems to be a good co to keep a watch. One needs to do some more indepth work on it as the stock has already done quite well and as per some industry reports, the margins had expanded due to crop failure in China and this may not repeat going forward. integrity of management? & that is one of the reasons of low PE. There has been a SEBI case on an operator present in several mid caps about 2-3 years back. And Sahyadri was one stock in his portfolio. So yes, that ways its a concern. However haven’t noticed anything particularly against the promoters. No issues at all about promoters. They r good people. Hv seen the fact also. What more details do u need? The factories r absolutely clean and managed very efficiently. Basically it is v easy to make this product. Just mix cement with water n asbestos fibre in a covered automated plant and out comes a cement sheet on a conveyer belt. Then ACS is either bake dried or nowadays does not even require baking. U must b aware abt their new plant near Surat which will cater to Guj mkt with reduced transportation cost. They hv inhouse tech to make moulds. 1. Why did they have poor results over last 2 years, Their margins were much lower than the competitors. 2. Most of the cos have started giving higher dividends inline with increase in earning. What are the thoughts of mgmt on this front. They need to improve the dividend payouts. 3. There was an operator – Sanjay Dangi, who was banned by SEBI. He also had Sahyadri in his portfolio. Any risk from that side? The margins wud hv been better if they did not focus on power generation for which they hav borrowed a lot. They were afraid that if there is a ban on ACS, then the co wud be in deep trouble. That was also the reason they did not start other biz in Sahyadri. Otherwise scene wud hv been different. They hv another unlisted co manufacturing cement blocks. I do not think they will increase the dividend as they hv invested heavily in Wmills by borrowing. Their ACS quality is on par with the best in the industry. If u see their Wind Mills in GB, they hv invested Rs 127 crores. This is a low return biz. They hv no connection whatsoever with Dangi. He was buying and at very high rates promoters decided to sell as they had to reduce their holding and bring it down to 75% as per the listing rules. But since the mkt price was so high they sold more. Their Lt debt is 87 crores and St is 59 Crores. So i personally do not believe that they will increase the dividend. Just my view. I may be wrong. They should stop investing in Wind Mills but they hv continued. Their factory is so clean that when we visited i requested for a mask n MD laughed at me! The co is now in the hands of younger generation who may not hv that much of an interest in this biz. Again just my view. u r welcome. When compared in your screen, how does Sahyadri look against Everest? However the co has been posting good results and can continue to do well. They had poor results because of interest costs shooting up. About margins are u talking abt total overall margins of margins from ACS? I was holding these shares but sold of at 160. In between they were planning to shift their Pune’s existing plant to Surat. Then suddenly decided to set up green field project at Surat. Why should there be any risk from Dangi? He has no connection with the group. I am surprised that u hv just few queries. In meeting that u attend, u must be asking many, right? So according to u, which is the best buy at CMP? If they stop investing in WM and start reducing the debt, then this share is to be watched. Lets see what they r doing. Do let me know what u found interesting abt this co. I think the stock has lot of value at these levels if they are able to maintain the steady growth as in past and contain debt going forward. What do you think about Sahyadri at these prices? I wud buy if they reduce debts! Any co u wud reco at cmps? I think Sahyadri deserves attention as they have grown well last yr and this years Q1 has been fantastic. Stock is trading at less than 4 times earnings. Among other ideas, plz look at – http://dalal-street.in/performance-and-status/ we have given remarks on our existing ideas. Do take a look at GRP, Smruthi, Muthoot Capital, Atul Auto etc. Don’t u feel that GRP will hv lesser profits in the CY? Will study Smruthi. Who are their main competitors? Atul Auto expansion, is it over? GRP – Let see two more qtrs. I think with the expansion done in South, the co should start growing and should do better in H2 and most probably do better than last year. Atul Auto expansion should be complete in this qtr. So the new capa of Atul wud be? 48,000 vehicles pa. Even without the expansion they have the capability to increase the production to about 30,000+ vehicles by increasing no of shifts. By increasing number of hours n paying overtime and or starting new shift, right? R u sure expanded capacity of 48000 wud start from this qtr? Management had indicated in some of the interviews that the capacity would expand to 48000 in this qtr. They don’t seem to be in a hurry as they are able to cater to the demand by increasing no of hours/shift as and when the demand is rising. Don’t u feel this co has threats from big daddy’s of the indian three wheeler industry? Pia, M & M, TVS etc? Or they r strong in cargo segments? What is the case for long term investing in these asbestos companies? I had invested in Visaka Industries around 2009/10 and after couple of years exited at significant loss including other opportunity cost. PE is low for them for the reason. . Although the financials are generally excellent with no debt etc. There is legal uncertainty all the time on their head due to anti asbestos activism, Though they claim that there is no health threat to workers. But such black swan event can knock out their business. No wonder Visaka kind of company is diversifying into other lines of business. May be good for medium term trading but long term investment looks a bad idea in these companies. As per a judgement by SC in India, there are no health hazards and hence the sector is safe. The issue was in the earlier methods of making fibre sheets in the US…now the process is quite safe. But yes, I do agree that this sector may not see a significant PE re-rating and is sort of a cyclical. Our view is more from a medium term perspective as the cos have been doing very well yet the stocks are available at less than 5 PE, below BV with a good div yield. The co’s Q2 nos are weak if we look at the growth by other cos in this industry…any idea for this slow sales? Would be great if you could get some clarity on future growth prospects. Sahyadri has a policy of not stopping production or reducing even during lean season of monsoon. They try to manufacture each and every day of the year. Inventory will pile up due to this policy during certain quarter. This actually helps them to plan their production for the entire year. Future will all depend on what they are doing in their wind mill biz. If they start concentrating on the core biz, it wud be better for them. Somehow, they fancy WM a lot. Not only the interest costs affects the figs but also management focus gets diverted. This was the reason I concentrated on Everest. I wud suggest that instead of the present form of site, the format just like theequitydesk.com wud be better for your site. This is just a suggestion. Since Disqus has good integrations with emails, thus we like them. There are a few good upcoming services like http://www.moot.it under active development and we might migrate to them once they are fully developed. Plz do share if there are any specific details. We are long term investors and discuss ideas based on fundamental analysis. Thus we recommend to hold on the shares for a longer term perspective until the performance of the co is not in line with the expectations. & seems restricting is going on, So please mention your updated view. on, so please mention your updated view. We have reduced some exposure and holding the rest of the quantity. It would be good if you can compile a short note like we post on cos, highlighting your investing logic. The co was previously Numeric Power and they had sold their core business at a very good price and hence the co is cash rich. But for future growth we need to have clarity on new business lines. What’s your take on Indag Rubber’s Q2 numbers? The nos are decent. The negative is – the co is slowing down while on the positive the investments/cash on balance sheet are growing. Regarding Screener. Can you include a comments feature for every company wherein registered users can put their own views on that particular company. I know that this would lead to a lot of garbage which would need regular monitoring and clean up. But I think its worth it and would add a human edge to the whole system. My 2 cents..
1) Canfin Trading at only P/E of 5 x Vs. 5.5 x of Muthoot. HFCs are the better way to invest in real-estate sector growth as you dont have to worry much about project approvals or governance issues. I expect its Book Value to touch Rs. 220 in two years and if bull market returns in 2014 then it can quote a 0.90 or 1 times BV , that means you can get 100 % returns. That said this stock might have frustrated as it has been trading at most of the times in a range (say 80 to 120 ) and i guess its topline and bottomline may grow around 15 – 20 % over next couple of years and growth might on your side in muthoot cap. I request comments on this pick by Mr. Ayush and other investors immediately and I realy appreciate Mr. Ayush for his fantastic stock picks and he is a true legend in small caps. As you see that the growth and ROE of Can Fin has been poor, thus the valuations have been cheaper. Muthoot Capital seems to be in an initial quick growth phase. The stock looks interesting if they continue to deliver. Ayush Kindly add the EPS in the previous quarter results in http://www.screener.in . We are working on adjusted EPS data for the quarters and will include that soon. I don’t track the same. But looking at the volumes, would advice caution.